UZBEKISTAN Millions of Uzbek cotton slaves to "make nation great"
Millions of Uzbek cotton slaves to "make nation great"
The harvest takes place every year between October and November and involves the entire population, including children, the elderly and pregnant women. The work is done by hand to maintain the high quality of the product. Hundreds of international brands interested in the Uzbek cotton, including Adidas and H & M.
Tashken (AsiaNews) - As every year since the Soviet Union era and still in 2012 thousands of people will spend the months of October and November in the fields for the traditional cotton harvest. A leading manufacturer of textile fiber, Uzbekistan is the only country where there is still forced state labor, from which no citizen is exempt. Public officials, including school teachers, check that all play their part, even children. The work is done for free. The state pays only a meager meal a day. After the campaigns to boycott Uzbek cotton used by H & M, Adidas and other brands, in early 2012 Prime Minister Shavkat Mirziyayev issued a decree banning children from working in the cotton fields. Other multinationals have joined and help to maintain the absurd tradition, which pours millions of dollars into the State coffers at the expense of the population. For two years, even medical staff is obliged to join the harvest. Malvina is a nurse in a clinic in Tashkent forced as other hospital staff to "offer" her time to the State for cotton picking. "I am over 50 - she says - and I suffer from asthma, but I still have to pick cotton by hand, and nobody pays me to do this." She spent the first few weeks of October in a camp in the northern region of Uzbekistan. With her there were other health professionals, including several doctors. "I did the job - she said - it was tough, no one was spared. Some people called asking for our surgeon, but he was working in the fields with us." She said that in 2011 the authorities required each district to send at least 330 hospital employees. "All my colleagues -she explains - tried to get out of it: those who claimed to have back pain, blood pressure problems, so on. Our manager did not want to listen to reason, saying that even pregnant women did their share, threatening to fire us all. " Malvina stresses that working conditions are grueling, the food offered by the State is poor and schools converted into dormitory often lack beds and so many people rent housing at their own expense. "To reach the field - she explains - we have to get up at four in the morning. The day ends at 18.00 with the sunset. Each group must reach a certain amount of cotton. We were obliged to collect 60 kg per day. More than once we failed to reach the quota and we bought what was missing from other groups. " 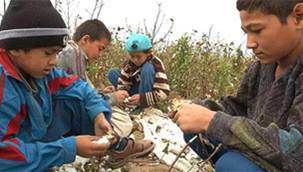 According to the government hand picking of cotton is one of the traditions that has made Uzbekistan first in the world in what is called "white gold". The handpicked product is superior to that taken by the machines and now many international companies and big brands of clothing buy cotton in Uzbekistan, ignoring the human cost. For many Uzbeks, the cotton season is an unbearable burden. A teacher in Samarkand, too ill to work in the fields, was forced to pay 100 dollars to a farmer to collect his share. "When the rector of the school found out - he says - he suspended my salary saying he needed to feed the workers housed in the premises of the university." He stresses, however, that due to pressure from the international community his students were spared from this effort. The recent decree signed by the government prohibits the employment of young people under the age of 15. However, according to Yelena Urlayeva an activist who for years travels the country to denounce the abuses, these measures are not applied in the most remote districts such. The children are forced to go to the field to compensate for the defections of sick or too old. For children aged 15 years and over the state sets a cotton quota a little lower than that of adults. Instead of going to school, students are taken by bus to the fields. Many of them get sick because of the cold, but the teachers, concerned about the daily quota, force them to work, threatening to expel them from the institute. Valentina Gurneyu, director of the Responsible Sourcing Network, Association for Human Rights that organized the boycott which was signed by a number of foreign brands, says that the government refuses to cooperate. For them, the cotton harvest is an internal affair, an opportunity of which every citizen should be proud. Those who oppose it - they claim - do not understand the culture of the country. "We have asked the International Labour Organisation (ILO) to send a mission to monitor the situation in Uzbekistan, at least as regards the exploitation of children, but so far we have not received any answer."